In the foothills of the Himalayas, overlooked by the white peaks of Kanchenjunga, 'Darjeeling' has been a popular hill station since the British established it in the mid 19th century. Located in the northern extreme of the Indian state of West Bengal in Darjeeling district, the exotic town lies just east of Nepal, south of Sikkim, and a bit west and south of Bhutan. 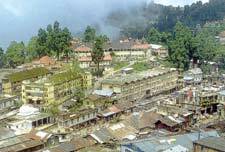 The town, also the headquarters of Darjeeling district is situated 305 miles north of Kolkata and is perched on the narrow Ghoom Senchal Ridge at an altitude of (7000ft), and descends abruptly to the bed of the Great Rangit River. The hill station presents the most spectacular views of the snow capped Himalayan peaks including Mt.Everest and Kanchenjunga. The name Darjeeling is derived from the Tibetan word ' Dorje Ling' (Place of the thunderbolt). According to legend, Darjeeling was struck by a mystic thunderbolt of the Lamaist religion, said to be the scepter of Indra, Lord of the Gods, which supposedly fell on the site known as the observatory hill. In Sanskrit, the word 'Durjay Ling', means 'Siva of invincible prowess, who rules the Himalayas'. Until the beginning of the eighteenth century, Darjeeling belonged to the Rajas of Sikkim, who lost their domain to invading tribes of Gurkhas from Nepal in 1780. In 1828, two British officers Captain G.W.A.Lloyd and Mr. J.W Grant stumbled on this remote Shangri-La and realized its potential as a strategic link with Nepal and Tibet, as well as a hill station sanitarium. On the direction of the then Governor General, Captain Lloyd negotiated with the Raja Of Sikkim and in February 1835, Darjeeling was presented to the East India Company. It became a popular resort for the British who wanted to escape from the sweltering heat of the plains. Orange and Cardamom are two cash crops of this district. Darjeeling peaks has steeply sloping conifer forests and terraced tea plantations surrounded by around 4,000 types of flowering plants and 300 varieties of ferns, including the rare tree fern. Darjeeling tea is famous throughout the world. During April - May, Magnolia and Rhododendron flowers magnifies the charm of the valley. The town is occupied by people from all over the eastern Himalayas who have come to work or trade as well as Tibetan refugees. This fascinating place also has a number of Buddhist monasteries and a considerable presence of visiting Buddhist monks and Tibetan scholars. Darjeeling has the unique attraction for its "Toy Train" which UNESCO recognizes as a World Heritage Railway. This famous narrow gauge steam railway makes its way from Siliguri -Kurseong in the plains up to Ghoom and Darjeeling in the hills. Its slow speed (six to seven hours to cover a distance of 82 kms) gives you enough time to watch and appreciate the beauty which nature has provided. This train passes through the forests, roaring rivers, over deep valleys and through mountains and tunnels. Darjeeling is also a trekkers paradise and the Gorkha hill council has provided ample trekking facilities for the adventure loving people. Located in the Himalayas, Kanchenjunga is the third highest mountain peak in the world. One of the most beautiful peaks it presents spectacular views from various spots in Darjeeling. The best uninterrupted views are to be had from Bhan Bhakta Sarani. Chowrastha or the mall is the heart of the town. In the local dialect, Chowrastha means the place where four roads meet. Mall road ascends to a hill lined with shops and there is a huge flat platform surrounded by benches for people to sit and watch the Kanchenjunga standing with all its might. A walk along the Mall Road provides a beautiful view of the surrounding hills with rhododendrons in bloom during season. This colourful monastery, located near Chowrasta, originally was a branch of the Nyingmap sect's Phodang Monastery in Sikkim. It was transferred to Darjeeling in 1879. The shrine here originally stood on Observatory Hill. The Gompa also has a library of Buddhist Texts which has a copy of the Tibetan 'Book of the Dead'. A few minutes walk from the Mall Road leads to the Observatory Hill offering a magnificent view point for the twin peaks of Kanchenjunga. The sacred Mahakal temple is situated here. Mahakal is considered as the incarnation of Lord Shiva. Adjacent to Mahakal temple is a Buddhist Shrine. This view point is sacred to both Hindus and Buddhists and the Hill is thronged by worshippers throughout the year. Tiger Hill, about 11km from Darjeeling at 8,515 feet is famous for its spectacular views at sunrise. The gold and orange vision of the peaks on the horizon is worth watching. From Tiger Hill, the top of Mount Everest is visible, peeping out through two other peaks Makalu and Kanchenjunga standing by its side. The peak that looks highest is that of Makalu. The trip to the summit of the hill is through Ghoom(7407 ft), the highest railway station on the Darjeeling Hill Railway. Situated close to the Tiger hill, the Senchal lake at 8031ft.supplies Darjeeling with its domestic water. It is particularly a scenic area and popular as a picnic spot. The Ghoom Gompa or Yogachoeling Gompa is the largest and most famous monastery located 8km south of Darjeeling Town, just below Hill Cart Road and the railway station near Ghoom. It was established in 1875 by a Mongolian astrologer-monk and contains a giant seated image of 'Maitreya Buddha' surrounded by sticks of incense, bells, drums and ornate thanka scrolls. Foreigners are allowed to enter the shrine and take photographs. A small donation is customary and the monks are very friendly. There are three other gompas in Ghoom, the very large but relatively uninteresting Samdenchoeling, the nearby and smaller Sakyachoeling and the Phin Sotholing. Nearer Darjeeling, on Tenzing Norgay Road, there is the Aloobari Monastery. The monks sell Tibetan and Sikkimese handicrafts and religious objects here. There is a cottage next door for enquiries. Halfway between Ghoom and Darjeeling is the Thupten Sangachoeling Gompa at Dali. Westerners interested in Tibetan Buddhism can study here. Himalayan Mountaineering Institute located on the West Jawahar Rd, was established after the conquest of Mt. Everest by Hillary and Tenzing. Tenzing Norgay was the Director of the institute for many years and after his death in 1986, was cremated near here. The institute conducts preliminary course on Rock climbing on Tenzing Rock and Gombu Rocks which is situated at Lebong Cart Road. Short films on mountaineering is also screened here. The mountaineering museum here contains a collection of mountaineering equipments including the ones that were used on that historic Tenzing Hillary climbs; specimens of Himalayan flora and fauna and relief model of the Himalaya. The Everest Museum next door traces the history of attempts on the great peak. Open daily 9am to 5pm. Near by, there is an interesting well manicured cemetery of former Raj residents. The Himalayan Zoological Park (2km from the town) next to the Mountaineering Institute is the only center in India for the captive breeding of Snow Leopards. The Park houses a wide variety of animals and birds some of which are Siberian tigers, Himalayan black bears, Yaks, Red Pandas and the Llama of the Andes. Open daily from 8am to 4pm. The botanical garden near the market was laid out in 1865 by Mr.W. Lloyd. It has an exotic and exclusive collection of a variety of Himalayan plants, flowers and orchids. There are beautiful orchid hothouses containing over thousands of species, Alpine flora including azaleas and rhododendrons, magnolias and a representative collection of the flora of the Sikkim Himalayas. The herbarium has rare botanical specimens. Closed Sunday and bank holidays. Open 6an to 5pm.The Victoria Falls is a half an hour impressive walk from the gardens. Tibetan Refugee Self Help Center was established for the refugees who had fled Tibet with the Dalai Lama after the Chinese invasion. Developed in 1959, this center is a workshop for the manufacture of handicrafts such as carpets, woolens, woodcarvings and leather work. These products and a variety of Tibetan Curios are on sale and the sale proceeds are shared by the Tibetan workers here. The center which has established itself in the International scenario as a place for hard work, self esteem and truth is very popular among the tourists. The Lebong Race Course, one of the world's smallest and highest race courses, was laid out in 1885 as a parade ground. Situated at a distance of about 8 km from the main town, the complete lap of the race course is only 480 yards long. It is pleasant for walks. 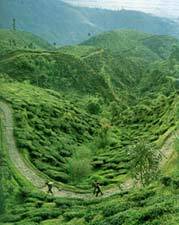 Darjeeling is one of the world's most famous tea growing centers. Here plantations were started in 1840's. The hill station is dotted with more than 70 tea plantations. Some of the well known tea estates are Thurbo, Margarets Hope, Castleton, Badamtam with a 14ft. bronze statue of the Buddha. The garden closest to Darjeeling is the Happy Valley Tea Estate. Here one can see the processing of the world famous Darjeeling tea. Open 8 am to 12am and 13 am to 16.30. Closed Sunday and Monday. Located at North Point about 3 km from the town, the ropeway covers a distance of 8kms in 45minutes and connects the North point (7000 ft) to the Singla Bazaar (800 ft). This was the first ropeway in India. The seats in the rope way is limited and it is better to get the tickets in advance. Timings 8am to 3.30pm. 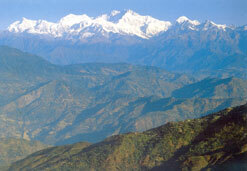 Located about 20km from Darjeeling is Singhalila, the highest National Park in West Bengal. Click here for more details.